For every fisherman out there, proper maintenance of your equipment is just as vital as the fishing process itself. This is because it ensures that the equipment will last for a longer duration as well as enhance their performance. A fishing reel is made up of mostly metallic material and this makes prone to rusting. For this reason, it is necessary to oil it so as to prevent this unfortunate process from occurring. Rusting is not only harmful to the equipment but to your health as well. As soon as you are done reading this article, you will discover that oiling your fishing reel is not that complicated of a task. We will guide you through the tools you will require as well as the step by step process of oiling the reel. There are materials that are just necessary for the process, the first one being the reel oil which will act as the lubricant. Then we come to the cleaners where you will need cotton swabs, paper towels and rags. You may include a toothbrush among the cleaners. It is also advisable that you have a flathead screwdriver nearby since the cleaning will involve disassembling some of the parts of the reel. When it comes to cleaning, you can also use isopropyl alcohol instead of the oil. You should be cautious with the materials you use for cleaning as some of them may end up doing more harm than good. For instance, using gasoline may result in the melting away of the plastic parts. You should therefore insist on sticking with biodegradable items. Let us now proceed to the main agenda, and that is of oiling the fishing reel. You will remove the spool assembly by turning the drag knob. Ensure that you turn it clockwise for it to be easier. If you happen to have a reel with a rear drag, push the release button to release the spool. Once you are done with the removal, look out for any damages that might have occurred to the spool, preferably in a properly lit room for better vision. Pay special attention to the spool lips, which if damaged would end up giving you a hectic time during fishing. If there are no damages, proceed to the next step of cleaning the reel. Start by dipping the cotton swabs into alcohol and slowly wipe the external sections. Wipe clean any traces of oil that may have been left behind. Now proceed to clean the line of the assembly. It is at this point that you should clean the internal parts. You can do this by pushing the cotton swab inside. Use more alcohol where there is rust. Note that we insist on cleaning before oiling since this would make the effect of the oil to be much more intense. The main purpose of a lubricant is to make the parts of an equipment to move more smoothly. Therefore, you should lubricate every moving part of the reel. This means that you should ensure that you have oiled the drive gear bearings, the bail arm assembly, maintenance port and the line roller assembly. You can apply a few drops of oil for each of these parts or you may dip the cotton swab into the oil before gently using it to spread the oil across all the parts. It is crucial that each and every part of the reel or its performance would be severely affected. Avoid using degreasers as they may contribute to the enhanced wear and tear of the internal areas of the reel. You can always seek professional help in the whole operation just in case you do not feel comfortable enough to carry the job out yourself. For instance, cleaning and oiling the internal parts of the reel can be quite tricky for even the best of them. There are practices which you can undertake to ensure that your reel last for a longer period of time. This would save you the cost you would have incurred from repairs and replacements. 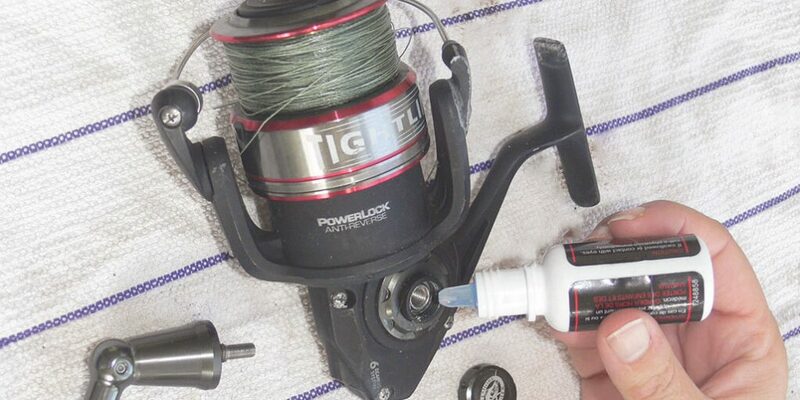 After every fishing trip, you should clean your reels with fresh water and give them time to dry. Use low pressure water as high pressure may force the dirt deeper into the previously clean areas. To prevent water from getting inside, always ensure that the drags have been tightened enough. You should also hold the spinning reels upside down to reduce the chances of water seeping in. Always leave the drag loosened when you are not using the fishing reel, since tightening it may render it ineffective. Loosening the drag also increases the lifespan of the fishing reel. You may also look out for obvious signs such as a fading line or the gradual weakening such that it can sustain less pressure than before. The reels would become stiff probably due to excessive grease on the gears. You would need to disassemble the equipment and remove some of this grease. Alternatively, you can remove the old grease which has sort of stoned up and replace it with fresher grease. You should find a carton with separate compartments which you can use in holding the spare parts. The compartments would ensure that the parts do not mix and you would have an easier time in identifying each of these parts whenever you need them. As we have seen, oiling the fishing reel is quite important. The equipment cost a lot of money to acquire and the oiling ensures that their lifespan is as long as possible. You would also get value for your money due to improved performance of your gadget.